Spin Column Protein Purification. Choose the most optimal spin columns! AHN myTube® spin columns are great for use in research laboratories and other institutions that work with protocols involving nucleic acid purification, isolation and separation of biological molecules, PCR product purification, spin column protein purification and recovery, sample preparation for next generation sequencing, and a variety of other protocols involving plasmid, viral and genomic DNA. 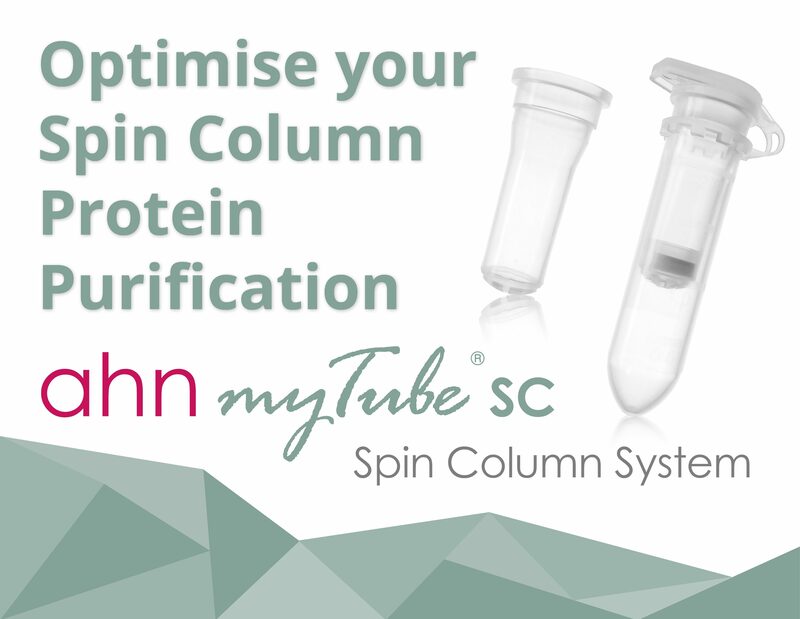 AHN myTube® spin column protein purification is a solid phase purification system designed with the end user in mind and it is well optimised to make laboratory work both quick and simple. Due to the vast scope of applications, the unique applications of myTube® spin columns are best outlined by describing the properties and use cases of the various filters that are supplied for the kits. Below, we have summarized filter types specially recommended for spin column protein purification. When coupled with nylon filters, AHN myTube® spin column protein purification becomes optimal for filtering protein-free culture media with very low extractables. This type of spin column protein purification is enabled thanks to the very good chemical resistance and the hydrophilic nature of the filter. AHN myTube® spin column protein purification can be used for all aqueous solutions. Thus, this kind of spin column protein purification can find application in protocols involving the removal particles from liquids as well as cell removal (both prokaryotic and eukaryotic). The nylon filters may also be used to remove DNA from acrylamide and agarose gels. Cellulose acetate filters for AHN myTube® spin columns come in 0.2 µm, 0.8 µm and 1.2 µm options. The cellulose acetate filters are hydrophilic, with a very low binding affinity and very low adsorption. This makes them ideal for spin column protein purification, including applications requiring maximum protein and enzyme yields such as tissue culture media filtration, cold sterilisation and biological fluid filtration amongst others. Cellulose acetate membranes have high flow rates, uniform pore structure, and great durability. Regenerated cellulose filters are cellulose filters with a 0.2 µm microporous structure. AHN myTube® spin column protein purification with regenerated filters is well suited for particle removal from organic and aqueous solvents due to their broad compatibility. Regenerated cellulose filters are hydrophilic in nature and are characterise by having low extractables, ensuring greater sample purity. This type of spin column protein purification also has very good chemical resistance for both aqueous and organic applications. Just like AHN cellulose filters, regenerated cellulose filters offer great structural stability. AHN myTube® spin column protein purification products, supplied with polyvinylidene fluoride filters, come with either 0.22 µm or 0.45 µm pore capacities. This kind of spin column protein purification can be used in general filtration and sample preparation applications. Polyvinylidene fluoride filters have excellent chemical and temperature resistance making them suitable for use with protocols that use aggressive and non-aggressive solvents. They are also hydrophilic, have high flow rates, and very low extractables. They have a very a low binding affinity and can be used for protein purification assays, especially for those samples with high levels of non-specific binding.